Barcelona, Spain (April 22-28, 2019). Stuttgart, Germany (April 22-28, 2019). Budapest, Hungary (April 22-28, 2019). Istambul, Turkey (April 22-28, 2019). This report sets out relevant performance statistics of the WTA TOP 100. (Ranking updated to November 19, 2018). The analysis covers the period from 01.01.2018 to 11.19.2018. For WTA are included the WTA Premier, Premier Mandatory, International and 125k Series and the WTA Finals. For the ITF are included Australian Open, Roland Garros, Wimbledon, US Open and the Fed Cup. 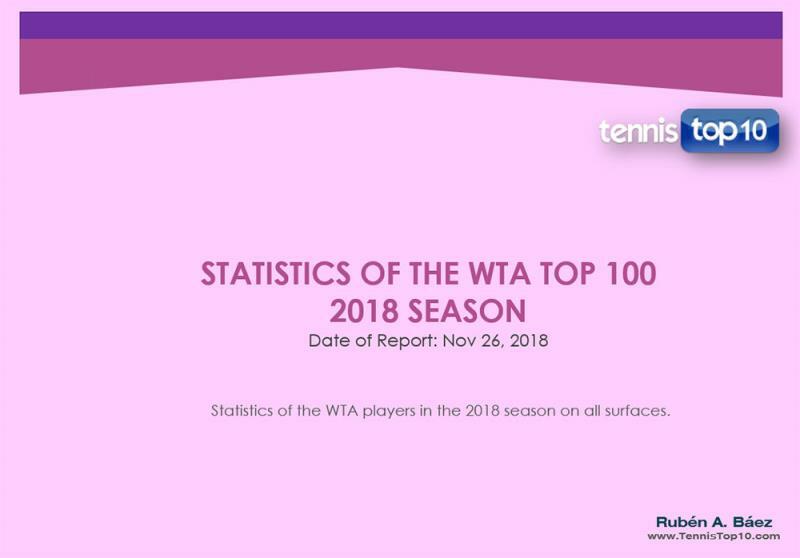 The statistics from the tournament’s classifications (Including the Grand Slams) and the others WTA tournaments are not included in this report. Tennis Instructor Level II (Argentine Tennis Association), Bachelor in Business Administration, Certified Public Accountant, Post grade’s degree in Finance Management and Capital Markets, MBA (IAE Business School, Austral University, Argentina). Will Rafael Nadal win another Roland Garros in 2019?